On Wednesday, October 31, and Thursday, November 1, Eastern American Diocesan vicar Bishop Nicholas of Manhattan paid an archpastoral visit to St. Elizabeth the New-Martyr Church in Rocky Hill, NJ, where he led the parish festivities in honor of the centennial of the Venerable Martyr Elizabeth and Nun-Martyr Barbara. This year, the hierarchs of ROCOR were visited Russia for the centennial of the Holy Royal Martyrs, and the parish feast day on July 18 was celebrated without the usual archpastoral visit. Instead, Bishop Nicholas promised to lead the divine services on November 1 – the day the Russian Church Abroad glorified the Holy New Martyrs & Confessors of Russia in 1981, among them Sts. Elizabeth and Barbara. At All-Night Vigil on Wednesday night, His Grace was co-served by Archpriest Andrei Sommer (senior priest of the Synodal Cathedral of the Sign in New York City), parish rector Archpriest David Straut, and parish Deacons Seraphim Komleski and Stephanos Bibas. 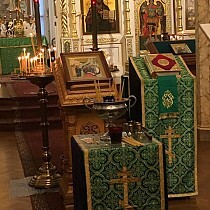 As a particular blessing to the parish, the services proceeded in the presence of a reliquary brought from the Synodal Cathedral, containing the right hand of St. Elizabeth and relics of St. Barbara. The faithful venerated the relics throughout the Vigil. The following morning, Bishop Nicholas celebrated Divine Liturgy, co-served by Archpriest Serge Lukianov (dean of New Jersey), Fr. Andrei, Fr. David, Archpriest Seraphim Chemodakov and Priest George Kaplanov (clerics of St. Alexander Nevsky Diocesan Cathedral in Howell, NJ), Protodeacon Serge Arlievsky (cleric of Holy Dormition Convent "Novo-Diveevo" in Nanuet, NY), Protodeacons Leonid Roschko and Paul Drozdowski (clerics of St. Alexander Nevsky Cathedral), and Deacons Seraphim and Stephanos. At the Sixth Hour before Liturgy, parish acolyte Patrick Hinds was tonsured a reader. Parishioners and guests from neighboring parishes – including many children – filled the church, and virtually all received Christ’s Holy Mysteries. "Thirty-seven years ago, the Russian Church Abroad glorified the Holy New Martyrs & Confessors of Russia in New York City; eighteen years ago, they were glorified in Russia. Today we also remember the centennial of the martyric deaths of the Romanov family members – among them the Grand Duchess Elizabeth Feodorovna – in Alapaevsk. We have commemorated this event throughout the year, especially this past July. On October 11, we also celebrated the finding of the relics of the Grand Duchess Elizabeth and Nun Barbara and the other Romanovs killed in the mine in Alapaevsk. "Today at Liturgy, we prayed and thanked God for giving us this marvelous church, whose patroness is the Venerable Martyr Elizabeth. Over the years, we have seen it grow and develop, just as we have seen the number of parishioners grow. "Today, on this especially joyous day, we must ask ourselves: do we stop here, resting after what we have accomplished, or do we continue our work? 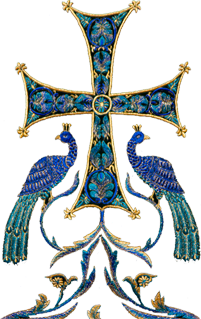 Of course, we will continue to bear our cross, and we will thank God for this parish, laboring on its behalf and unto the salvation of our souls. Let us consider what has been done correctly, and what has not. And let us learn from both our accomplishments and our mistakes. We wonder, how do we do this in a world of sin, misunderstanding, and evil? Let us labor in imitation of our holy patroness – the Venerable Martyr Elizabeth. "During the revolution in Russia, during her imprisonment in Alapaevsk, she and Nun Barbara would continue to fulfill their monastic prayer rule, and we know now that, when she would attend the services, there was a sense of peace and prayer about her. Despite the fact that evil abounded, she preserved her inner peace and a prayerful spirit. "She was imprisoned, without food, in the cold, in sickness. But even in these conditions, she served the sick, acting in such a way that everyone around her felt love, consolation, and peace. And this is an example for us, that even outside of the church, in the world, we can preserve peace and a prayerful light, so long as we keep the rules of the Church, so long as we will ask for help from God, and ask for help from St. Elizabeth." A moleben was then served with a procession around the church. The diocesan vicar and clergy took turns blessing the faithful with holy water. Returning inside, the protodeacons intoned the Polychronion for the hierarchs, clergy, parishioners, namesday celebrants, and the new reader. Upon conclusion of the Liturgy, Bishop Nicholas congratulated Fr. David and all of the celebrants on the joyous occasion and surrogate patronal feast day. Fr. Serge likewise greeted his brother-concelebrant, and on behalf of the diocesan cathedral presented the parish with a new anointing brush. Fr. David thanked all of the guests and those who had labored in organizing the feast, and invited all to a festal luncheon. Once everyone had gathered outside, the parish’s new permanent pavilion – attached to the back of the church – was blessed. The luncheon then began, and the clergy and faithful spent the rest of the afternoon relaxing and enjoying one another’s company.